A friend of mine has started taking me to Food Basics down at Herongate. It’s got some great deals, including large pita bread at $1.69 per package. That’s 6 very big pitas–about 12″ across–at about 30 cents each. I’ve been getting the whole wheat ones which are very tasty and also very filling, especially with hummus or refried beans. Yum! Last time I went I stocked up and got about 4 bags and thew them in the freezer. Now when I want something to dip, roll or top, I pull out a pita. But my favourite thing to do with them, especially if they sit around and get a little stale, is to tear them up into pieces and toast them in the oven to make “chips”. Super fast, healthy, substantial and delicious. Maybe next time I will try brushing them with butter or olive oil, plus some salt and/or spices for an even more delicious treat. Other things I’ve been doing with the pitas include tearing away one half, folding it over with shredded cheese inside, and making a melt in my skillet. I’ve also used them as a wrap for scrambled eggs, but you could wrap anything inside really. 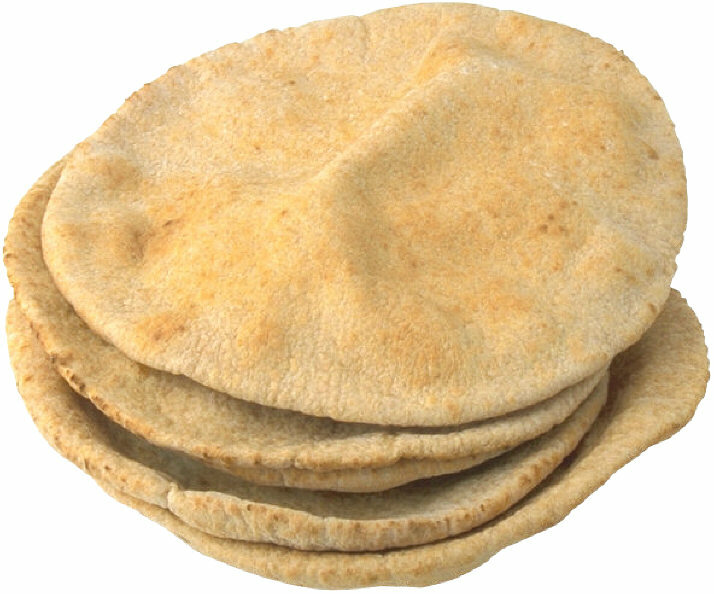 What do you do with your pita bread? As it turns out, I’ve made quite good progress working through my giant jar of mayo. And it’s all thanks to this recipe for my “A-mayonnaise-ing” chocolate chip cupcakes. It’s adapted from a America’s Test Kitchen recipe for “Emergency Chocolate Cake” which is both SUPER easy, and also takes a full cup of mayonnaise. I’ve added chocolate chips for extra-chocolatey flavour, and made it into cupcakes so I can freeze most of them and ration them out to myself during those long afternoons (defrosted for 25 seconds in the microwave). 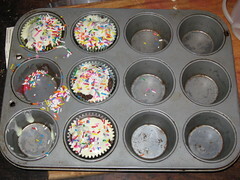 Preheat oven to 350 degrees F. Grease a 12-cup muffin tin very well or line with cupcake papers. Sift together flour, sugar and baking soda. Add chocolate chips and stir to combine. In a separate bowl, whisk together cocoa powder and water until smooth. Add mayo and vanilla and again whisk until smooth. Add wet ingredients to dry and stir until combined. Then portion into the cupcake tin. Bake for approximately 30 minutes, or until a toothpick inserted into one of the interior muffins comes out with only a few crumbs attached. I have had a tough time taking them out of the cupcake pan, so if you have any tips, please let me know. Cup liners might be preferable (though my current strategy of eating all the crumbs–er, chunks–that fall off or stick or smoosh off is working pretty well for me). I eat them as-is but you could probably ice them if desired. To freeze, I wrap each one in a square of wax paper and then store two wrapped cupcakes in a ziplock baggie (I actually use an empty milk bag, but have recently learned that Ontario is the only province that sells milk in bags. Seems unbelievable, but apparently is true). In any case, I’m hopelessly addicted to these delicious things. I just might buy another big tub of mayo just so that I’ll “have to” make batch after batch of chocolate chip cupcakes. Sneaky Chef Chocolate Cupcakes: It’s a Win! Well, I finally got around to trying a recipe out of The Sneaky Chef, the Chocolate Cupcakes, and I have to say they were fantastic! I’m not going to post the recipe here because I want you to go out and buy the book, but let me just tell you they contained whole wheat flour, blueberries, and . . . spinach! Yes, spinach. But it turns out, spinach has almost no flavour on its own; it is totally masked by the blueberries to make what Missy Chase Lapine calls “Purple Puree”, one of her power-packing additive mixtures. The other genius trick employed with these cupcakes is to use candy sprinkles as a texture decoy to distract from any textural difference the whole wheat flour could cause. She recommends using sprinkles, chocolate chips, and crushed crunchy whole-grain cereal as textural cover-ups where necessary. This is just one more of her thirteen strategies for healthier kid-friendly eating. I gave a few of the cupcakes to friends as well, so I’ll update with their comments if they have any. I was a bit nervous, especially since the “icing” is actually a mixture of nonfat milk powder, icing sugar and water, but after trying them myself I’m fairly certain they will have gone down just fine! The Holy Grail of Cookbooks for Moms? We’re a hilarious comedy duo; you should check us out some time. Well the next day, I went to the library where I spotted this cookbook I’ve noticed a bunch of times before and completely dismissed as pretty but not at all interesting to me. This time was different. This time, it was ‘The Cookbook’ I’ve been longing for! It’s called Deceptively Delicious, a well-designed book of recipes written by Jerry Seinfeld’s wife Jennifer. And while I haven’t actually *tried* any of the recipes in the book (I have much more time for reading than I do for cooking these days, and even that means like 20 minutes a day! ), the concept is absolutely brilliant in its simplicity! And what is this amazing revolutionary concept you ask? Simply this: puree vegetables and fruits and add them to everything. Any recipe you can think of can probably take an extra quarter- to half-cup of fruit or veggie puree. Brilliant! Now you can get your kids to “eat their veggies” without the begging, bribing or cajoling. The book has some great strategies: First of all, do a bunch of purees at the beginning of the week, portion them in ziplocks and stick them in the freezer for use later in the week. That way you can build up a stock of different veggie purees, for use where they make sense. Then you simply thaw a puree when you need it. Cooking strategies include: Mixing veggie puree with the egg for breadcrumb coatings (chicken nuggets, tofu nuggets, mozzarella sticks). Using sweet veggies like squash, sweet potato and carrots added into sweet breakfast items and baked things. Matching colours to add yellow veggies secretly to carb dishes like couscous or “buttered” noodles, orange veggies like carrots to cheese sauce or cauliflower puree to potatoes. So, while I haven’t yet tried any recipes, I got my partner to pick up a squash, a cauliflower, some sweet potatoes and some frozen spinach at the grocery store today. If I get some time tonight I’m going to roast a bunch of stuff for pureeing very soon. I will update you on the success of this trickery. In any case I’m hoping to increase my own veggie intake. While my daughter has been fattening up on mama’s suddenly abundant milk supply (and foregoing most food while she’s at it), my own diet has been distinctly lacking in anything fresh and colourful lately. So anything that allows me to quickly and easily add veggies where there were none before, is a great, great thing. Maybe even the Holy Grail. I don’t have one myself, but you can do all this in a food processor. The instructions here are for doing it by hand. Finely chop the salmon (or mash if using canned) and add 1/4 cup breadcrumbs and the mayo, onion, parsley, lemon juice and salt. Mix together well and form into patties. Depending on how much fish you’ve used you might get between 5 and 7. Put patties in the freezer for 10-15 minutes to firm up before breading and frying. Place flour, egg and remaining breadcrumbs separately into 3 bowls. Working with 1 patty at a time, coat in the flour, then douse in the egg, then cover in breadcrumbs. Once you’ve breaded all the patties they are ready to fry. Heat 1/2 cup of veg oil in a heavy-bottomed frying pan over medium to med-hot until quite hot. Place the patties carefully in the pan and cook until browned, flip over and brown on other side. Serve with lemon wedges. I also like a simple sauce made with a mix of mayonnaise, grainy mustard and tangy dill relish. Add a salad and a glass of wine, and you have the makings of a lovely light summer dinner. My somewhat picky toddler enjoys these for their “mild flavour”–sans lemon, sauce & wine of course! I made some delicious roulades yesterday based on this recipe from a blog called “Souvlaki for the Soul” (picture to come!!). Now, I’ve been looking for a food just like this: a compact savoury snack that’s versatile, not too fiddly to make, and perfect for taking on the road. These Roulades (as I’m calling them) fit the bill 100%! They can also be made to fit a budget (the feta in my recipe was a bit pricey), and also to use up things in the fridge that need eating up. Attention: moms, the pastry would be fun to make with kids, and they make great park food! They’re also fun to eat. It would be easy to do a sweet or savoury version, and the fat content of this particular pastry recipe is not too high. The filling here was too much of a “strong flavour” for my little one (she prefers “mild flavour”), so next time I might substitute ricotta for the feta. And I’m dreaming about doing a pizza roulade for our road trip tomorrow. One caveat: though these are perfect foods for taking on a summer picnic, they are not so much fun to cook on a hot day, as they require about 30 minutes in a 400 degree oven. But if you have a cool evening, it might be worth whipping up a batch for the next couple days’ lunches. Sift together flour, baking powder and salt. Cut in the fat using a pastry blender or a food processor until the mixture resembles coarse breadcrumbs. Then add the milk slowly as you gently stir with a fork. Stir together until a soft dough is formed. Knead gently for 1-2 minutes or until smooth. Wrap the ball of dough and put in the fridge for 10-15 minutes to relax while you make the filling. Mix all together in a bowl and season with pepper if needed. Preheat the oven to 400 degrees F. Remove dough from fridge and roll into a 35 x 20 cm rectangle. Spread filling over the rectangle, leaving a bare “lip” at the end. Gently roll lengthwise. Brush the bare “lip” with water or egg white to seal the roll. Chill for 2 hours (or not) and then cut into rounds, about 1.5 cm thick. Place on a baking sheet lined with parchment paper, leaving some room between each roulade for expansion. Bake for 15 minutes, then remove and rearrange on the baking sheet so they bake evenly. Return to oven for 15 more minutes or until lightly browned. Enjoy, with a bowl of gazpacho soup, or on a shady blanket in a sunny park.